Louis Pasteur is one of the ‘greats’ of science. Countless millions of people alive today owe their lives to his discoveries. Pasteur revolutionized chemistry and biology with his discovery of mirror-image organic molecules, then founded microbiology with his work on fermentation, his discovery of anaerobic bacteria, and his establishment of the germ theory of disease. The process he invented to stop foodstuffs going bad, pasteurization, is still in use worldwide today. Louis Pasteur was born in the market town of Dole in eastern France on December 27, 1822. His father was Jean-Joseph Pasteur, a decorated former sergeant major in Napoleon Bonaparte’s army, who now worked as a tanner. His mother was Jeanne-Etiennette Roqui. Loius had an older sister and two younger sisters. The family lived modestly. When Louis was four years old his family moved to the nearby town of Arbois. He started school aged eight at the École Primaire Arbois – it was actually a single room in the town hall. He could already read, having been taught by his father. His teachers rated his childhood academic ability as middling. In his teenage years Louis received free tutoring from his father’s friend, Buousson de Mairet, a scholar. With this extra help, Louis began to show a growing academic ability – he started winning prizes at school – and it increasingly looked like a degree-level education would be appropriate for him. His father envisaged his son becoming a respected teacher at a high school. Pastel portrait of his father, by Louis Pasteur, aged 15. In addition to his academic prowess, Louis also showed considerable artistic talent, especially his pastel portraits. At the end of October 1838, aged 15, Louis Pasteur arrived in Paris, where he was to live in a dormitory and attend a boarding school – the Institution Barbet – to prepare him for the École Normale Supérieure in Paris – an elite college – often called more simply the École Normale or ENS. Unfortunately Louis was utterly miserable in Paris, missing home terribly. He lasted a little over two weeks before his father made a long journey and took him home to Arbois. In 1839, aged 16, he moved to Besançon, just 30 miles (49 km) from Arbois to board at the Royal College, a high school. Closer to his hometown, he felt less homesick, worked very hard, and passed his school diploma exam in 1840. He was then able to earn money as a teaching assistant at the Royal College. For two years Pasteur earned money while he improved his academic qualifications. He then sat the entrance exam for the ENS. He failed. Although he had prepared for the exam by taking extra lessons in mathematics, physics and chemistry, he had also spent of lot of his time – too much time – drawing pastel portraits. Pasteur worked for another year as a teaching assistant before moving to Paris in 1843 to study at Lycée Saint-Louis, a high school that aimed to get its students into the ENS. There he won the prize for top physics student and passed the ENS’s entrance exam with a high rank. In 1844, aged 21, he entered the École Normale Supérieure. In 1845 he earned his science degree. In 1846 he placed third in physical sciences in the Agrégation – a highly prestigious government-run open exam for anyone who wanted to work in education: following this he was assigned to a high school teaching job in Tournon – a thought that horrified him. He wanted to stay in Paris and continue with scientific research and higher-level teaching. Fortunately, a chemistry professor at the École Normale by the name of Antoine Jérome Balard had liked what he’d seen of Pasteur. Balard was an eminent scientist, famed for his discovery of the element bromine in 1826. He offered Pasteur work as a chemistry graduate assistant along with the opportunity to carry out research for a doctorate. Balard also waged a successful campaign against the government education department, which was trying to force Pasteur to move to the teaching job in Tournon. 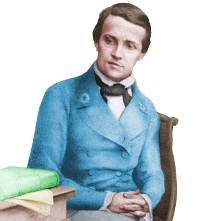 In 1847 the 24 year-old Pasteur submitted a thesis in chemistry and a further thesis in physics. He was awarded a Ph.D. He had worked incredibly hard on his research – a habit that would remain with him all his life. The following year, aged just 25, he was appointed as professor of chemistry at the University of Strasbourg. Pasteur made his first great discovery in 1848. For a number of years, scientists had been puzzled about organic chemicals such as tartaric acid. A large number of natural organic substances had been found to rotate the plane of polarized light to the left or right, while the apparently identical substances made in the laboratory did not. Pasteur, who had made a study of polarized light for his physics thesis, discovered the solution to the puzzle. He showed that molecules could exist in mirror-image forms, as shown in the image below. Left and Right Handed Molecules: although the molecules above appear very similar, they differ in the same way as your right hand differs from your left hand. One molecule is a mirror image of the other. They cannot be superimposed on one another. They affect light differently. This was an enormously significant discovery in the history of science, revealing an asymmetry at the very heart of the natural world: many of the molecules made in nature are either left- or right-handed. Pasteur’s discovery paved the way for crucial breakthroughs in chemistry, biochemistry, and pharmaceuticals. In 1854, aged 31, Pasteur left Strasbourg to become Dean of the Faculty of Sciences at Lille University – a very senior position for such a young scientist. One of his students at Lille told him about a problem that was bothering his industrialist father. Emile Bigo-Danel’s father owned a distillery in Lille that converted sugar beet to alcohol by fermentation. Sometimes the fermentations went wrong and produced low concentrations of alcohol. Sometimes the alcohol soured. 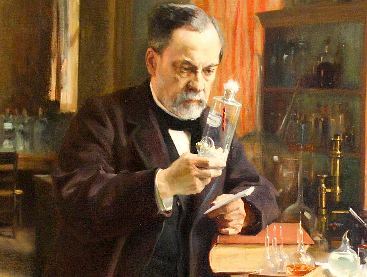 Pasteur was fascinated by the problem and decided to investigate the phenomenon of fermentation. At the time, the most commonly accepted explanation of fermentation was that it was a process caused by yeast – a single-celled microorganism – dying and decomposing. This was despite the fact that in 1836 Theodor Schwann had already shown that fermentation of sugar to alcohol required the action of living yeast. Schwann had been ridiculed for his work! In 1858 and subsequent years, Pasteur published the results of the intensive research work he carried out in Lille, establishing that fermentation is a process involving the action of living yeast. Living yeast converts sugar into alcohol. He found that the action of a different yeast makes milk go sour, converting milk sugars to lactic acid. If this yeast contaminates a wine fermentation, the wine is soured by the production of lactic acid. His work was conclusive. The scientific world now accepted that the action of living yeast was necessary for fermentation to take place. In 1857, aged 34, Pasteur returned to the École Normale in Paris as Director of Scientific Studies. No laboratory was available for him and the government said there was no money to fund any research. Determined to continue with his work, Pasteur personally paid for the conversion of part of the École Normale’s attic space to a laboratory and funded his own research work there. His faith in his ability to make more scientific breakthroughs was soon rewarded with the discovery of an entirely new type of living organism – anaerobic microbes – microbes that live without the need for air or the oxygen gas it contains. After spending several years observing the beneficial and harmful effects of microbes on foodstuffs, in 1862 Pasteur invented the pasteurization process. During pasteurization, farm and brewery products such as milk, wine and beer are heated briefly to a temperature between 60 and 100°C, killing microorganisms that can cause them to go bad. Many scientists continued to believe that simple lifeforms were spontaneously generated; this despite the fact that a number of scientists, such as Theodor Schwann, had carried out work showing that microbes could not simply appear out of nowhere in dirty ponds or decaying meat. When they learned that Pasteur was going to enter the ‘life’ debate, his scientific friends tried to dissuade him – it was too hot a topic to handle and they didn’t want to see their friend burned! However, Pasteur’s work in the laboratory had already convinced him that Schwann was correct. In 1860 the French Academy announced a prize of 2,500 Francs to anyone who provided convincing experimental proof for or against spontaneous generation of life. Pasteur was awarded the prize in 1862. He showed that no microbes ever grew in nutrient solutions that had been sterilized by heating, provided the air above the solutions was also sterilized. If unsterilized air was allowed into the space above the solutions, microbes began growing in the solutions. The microbes were present in the unheated air. A colony of bacteria. 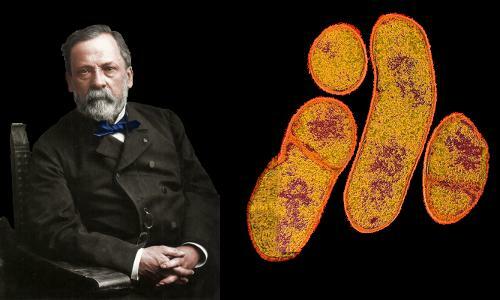 Pasteur provided the evidence that finally convinced the scientific world that microbes could not spontaneously generate. Pasteur’s work in fermentation and spontaneous generation and his discovery that pasteurization could prevent foodstuffs going bad led him to the conclusion that diseases are caused by germs – microscopic organisms. To stay healthy we need to prevent these organisms getting into our bodies. Pasteur recommended using filtration, exposure to heat, or exposure to chemicals to remove germs. Joseph Lister read Pasteur’s work, and in 1867 he implemented antiseptic methods in surgery – sterilizing surgical instruments and cleaning wounds with carbolic acid. These innovations cut infections and deaths following operations dramatically. In 1863 Pasteur became professor of geology, physics, and chemistry at the Ecole des Beaux-Arts of Paris. Soon he turned his attention to a problem that had very little to do with any of the subjects that he was professor of. The French silkworm industry – indeed the entire European silkworm industry – was being destroyed by a disease nobody seemed to be able to stop. Government tax revenues had been devastated and areas once prosperous were beset by poverty and hunger. Pasteur was not a biologist. He knew nothing about worms. He had never performed a dissection in his life. In 1865, however, he was implored to investigate the problem. He did not want to get involved, but after turning down repeated requests, he finally accepted the task. And having accepted it, he launched himself into it with enormous energy, working until his health broke from exhaustion. His wife, Marie, also launched herself into the work, growing the silkworms he needed for experiments and writing notes. Finally, after several false dawns and mistakes, near the end of 1867, Pasteur discovered that the silkworm’s eggs were being attacked by parasitic microbes. He gave instructions to owners of farms telling them how to prevent the problem. Next season, he was almost reduced to tears when problems persisted. He realized then that there must be a second microbe at work, totally independent of the first one. Pasteur conquered this microbe too, but at great personal cost – in 1868, aged 45 he suffered a stroke. In the same year the brilliance of his work was recognized by the University of Bonn, where he was made an honorary Doctor of Medicine. The Austrian Government awarded Pasteur the 5,000 Florins they had offered as a reward to anyone who could solve the silkworm problem. The work he carried out on silkworm diseases left him eager, despite now suffering from health issues of his own, to apply the lessons he had learned to human health. Pasteur discovered methods of protecting people against two deadly diseases – anthrax (demonstrated in 1881) and rabies (demonstrated in 1885). He devised ways of producing weakened forms of the anthrax and rabies microbes and used these to vaccinate people. When injected into people, Pasteur’s vaccines fired up their immune systems so potently that they were able to overcome the deadly forms of the diseases. Pasteur’s success in the case of anthrax left a bitter taste in the mouth of a medical rival, and was certainly not in the best traditions of science. Pasteur secretly used the method of Jean Joseph Henri Toussaint, a veterinarian, to prepare anthrax vaccine for a public demonstration, rather than his own patented method. Toussaint should be remembered as the discoverer or (at the very least) co-discoverer of the anthrax vaccine. Louis Pasteur in his laboratory. The red object in the jar is the spinal cord of a rabbit infected with rabies. He used this to develop the rabies vaccine. In 1887 Pasteur founded the institute that bears his name. The Pasteur Institute seeks to continue its founder’s goals of studying microorganisms and treating and preventing diseases. Eight of its researchers have been awarded Nobel Prizes in medicine. Its researchers were the first to isolate the HIV virus and their discoveries have led to better treatments for deadly diseases such as diphtheria, influenza, plague, polio, tetanus, tuberculosis, and yellow fever. Pasteur spent the final years of his life, from 1888 onwards, living with his wife Marie in a large apartment he created for himself at the Institute in Paris. She continued to live there for 15 years after her husband’s death, until her own death in 1910. Soon after arriving to become professor of chemistry at Strasbourg, Pasteur met Marie Laurent, daughter of the university’s rector. They married in May 1849. Pasteur was 26 and Marie was 23 years old. Marie married Pasteur knowing and accepting that he was unusually dedicated to his research work – the story goes that on their wedding day someone had to be sent to the laboratory to remind Pasteur to go to his wedding! Following their marriage, Marie became Pasteur’s trusted sounding board for ideas and the recorder of his thoughts. The couple had five children, of whom three died of typhoid in childhood – an almost unbearable loss for the couple. At the age of just 45 Pasteur suffered the first of the strokes that would undermine his health in his later years. In 1894, aged 71, a major stroke hit his health badly. Louis Pasteur died of a stroke in Paris on September 28, 1895, aged 72. He was held in such high esteem by the people of France that he was buried in the Cathedral of Notre Dame after a state funeral. Later his remains were moved to a crypt in the Pasteur Institute in Paris. When Marie died, she was also buried in the Institute’s crypt. "Louis Pasteur." Famous Scientists. famousscientists.org. 20 May. 2016. Web.